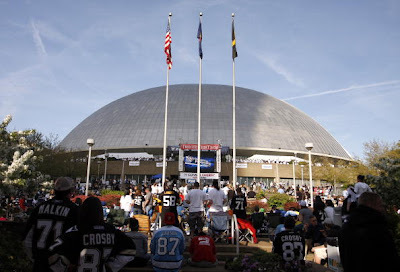 Mondesi's House: AT THE FAN: WHAT TO DO WITH MELLON ARENA? AT THE FAN: WHAT TO DO WITH MELLON ARENA? As Mellon Arena's days dwindle, a debate has risen as to what should be done with the unique building once the Penguins' season is complete. On one side, you have a grassroots campaign to preserve it and make modifications to the area surrounding the Igloo. 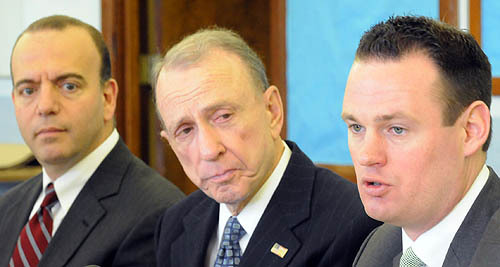 On the other side sits the Penguins and the politicians, which both want to level the arena and start anew with development. Sensing a debate in the air, I chose this as a topic for discussion on The Fan this week, and I recently wrote an article outlining the possible outcomes of the arena drama that you can see here (and yes, there's a poll). I'll be presenting the arguments in audio form with Paul Alexander, Jon Burton, and Jim Colony on Monday morning at 8:40 a.m. on the Fan Morning Show. I would love to see something cool to be done to preserve it's memory, but I can't imagine anything more happening than it being imploded like all the other abandoned sporting venues. My heart says keep it, but my brain knows it's going to be gone. Turn it into a giant mansion for Sid so he moves out of Mario's place. Turn it into one giant grocery store for Hill District residents. Maybe I'm being too practical, but I really think the right thing to do is Ravenstahl's plan: tear it down and restore the original street grid patter of the neighborhood that it replaced. Unlike PNC Park and Heinz Field, they tore down homes and displaced families (mostly Italian and black) to build the arena. They need tax dollars in the city, and it could be developed much like the SouthSide Works with fun retail, bars, & restaurants on the first floor with condos and apartments above. It would be nice to create an area similar to that around PNC Park around the new arena - I just don't see that same rush to rebuild the area between the new arena and Duquesne. Thinking more about it, I'd like to see them keep the marquee at the bottom of the hill similar to the way they kept that Gate D tower from Three Rivers. Blow that bad boy up and make more parking, maybe even a more modern hotel area. I work in that area, and there isn't enough of either. As much as I would like to see it stay up and turned into an ice skating rink or the such, the fact of the matter is, it has to go. That's valuable property right there, and a shopping area or parking garage would be the best use of it. Preserve it. This is our history. It was ahead of its time. It would be a sin to demo it. Level it. Put something useful there. Trade it to the Jets for a 5th round pick. Downtown Pittsburgh needs revitalized, and if a mix of commercial and residential areas there can lead to it, then take down the arena. SouthSide Works is nice, I was impressed when I went down there when I saw it the first time, but I'd like them to build up not out. No need to get sentimental over concrete, steel, and glass. Progress is sitting a few blocks away with 66 luxury suites. If this event occurred in 2006 when the Pens were 22-46-14, nobody would have second thoughts about demolishing the arena.